The Astronomical Society of South Australia is the only representative body for amateur astronomy in the state of South Australia. Founded in 1892 and with around 600 members, it is the oldest and one of the largest organisations of its kind in Australia. Our monthly meetings, which usually feature a guest speaker, are free, open to the public and visitors are most welcome to attend. Collapsars are literally Collapsed Stars which have gravitationally contracted at the end of their long lives into incredibly dense objects. In this session, we explore White Dwarfs, Neutron Stars and Black Holes. Earth's encounters with comets has led to megafaunal extinctions and collapse of Chinese dynasties. Throughout history, comets have been seen as omens of change and disaster in many cultures. The legends of St Michael, feathered serpents, and celestial dragons are some examples of these encounters. Given that the 12,900 BP cometary impact event (called the Younger Dryas) created massive wildfires etc it also caused the extinction of numerous large animals like the mammoth (megafauna). Presented by Assoc Prof Vic Gostin, University of Adelaide. Experience the night sky through our telescopes at public viewing nights. 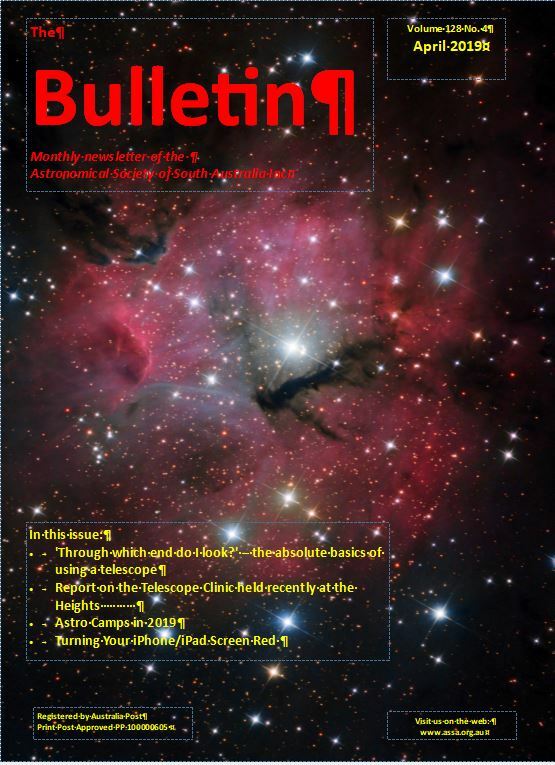 Each month the Society publishes The Bulletin - a 16 to 20 page newsletter for members, containing information on astronomical news and events. Membership is open to people of all ages and professions— the only pre-requisite is an interest in astronomy. It does not matter how much you know about astronomy or any other science. The Society has something for you.Our members come from all walks of life. What they share is the enjoyment the night sky has to offer.